Norwescon is this weekend. I didn’t get a program invite, so I’m doing a guerrilla reading of Arabella of Mars in my room! 4pm Friday in room 5102. Please share! If you’re on Facebook, the Facebook event invitation is here. Please RSVP and invite your friends! “Damage” is a Nebula nominee! 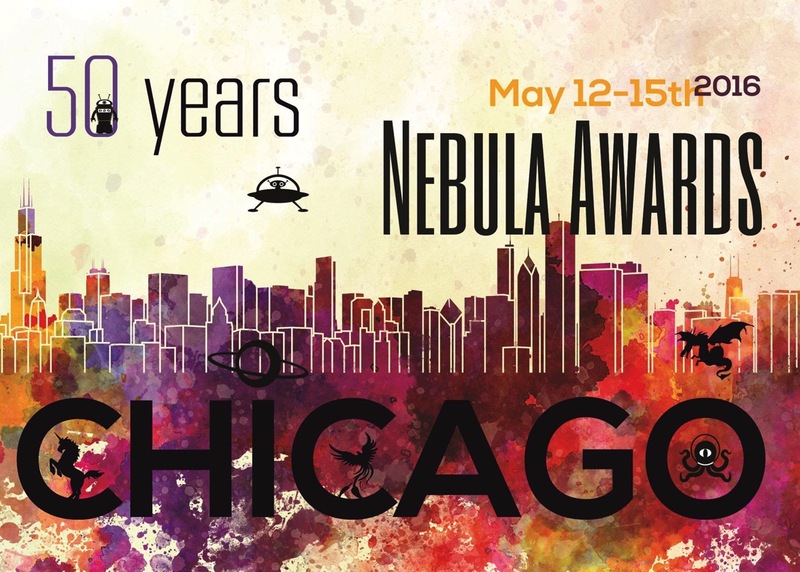 I am proud to announce that my short story “Damage” is a nominee for the Nebula Award! 02-20-2016 at 09:07 AM Comments Off on “Damage” is a Nebula nominee! If you are a SFWA member, today is the deadline to nominate for the Nebula Awards. If you are a member of the current Worldcon (MidAmeriCon II), the previous Worldcon (Sasquan), or the next Worldcon (Worldcon 75 in Helsinki), you can nominate for the Hugo Awards through March 31. I’ve just been reminded that I have been remiss in posting my eligible works for awards this year. Of these, I am most proud of “Damage” — in fact, I think it’s the best short story I’ve written in years. If you read it and agree that it’s award-worthy, I hope you’ll consider giving it a place on your award nominating ballots. Kate has actually done really well this month. After last month’s Avastin treatments and positive MRI, we reduced her steroids (which caused many nasty side effects including weakness, bruising, and diabetes) from 8mg per day to 6mg, then 4mg, and now 3mg. She’s doing fine on that dosage, and is showing considerable improvements in the side effects: her face and feet are less swollen, her blood sugar is much better (almost never over 200, usually below 130), and she seems less weak and wobbly. The improvements are slow and subtle. I sometimes wonder if they’re really there, and Kate can’t perceive them at all. But her doctors, who see her only once a month, say that she’s more alert and “present” and that she’s smiling and laughing. So things are really looking up. Another bit of good news: she was having some problems with her vision (no, really, good news… wait for it…) so we went to the eye doctor, who determined that her retinas are okay but her glasses prescription (which we just updated six months ago) is changing back toward what it was before the brain surgery. So she needs new glasses, but the implication is that decreased brain swelling is reducing the pressure on the optic nerve, allowing her eyeballs to begin to return to the shape they had before. She will probably need new glasses again in six months at this rate, but it’s a small price to pay. Mind you, she is still using a walker and she does still have some aphasia, memory lapses, and cognitive problems. But all of these issues are slowly improving, we are continuing to reduce the steroids, and we plan to resume physical therapy soon so she can start putting back the muscle the steroids have stolen from her. She’s already started doing chair yoga, and walking and doing home-based PT as much as possible. It’s going to be a long process but the outlook is good. We visited New York City last week, where I met with my agent and editor (neither of whom I had met in person before) and many other publishing professionals including the buyer for Barnes & Noble. Kate didn’t really have the energy to do any touristing, but we hung out with a few of our NYC friends and saw the play King Charles III, which was brilliant. In the last month we have also enjoyed Lily Tomlin’s one-woman show, the NT Live production of Jane Eyre, the cast album of Hamilton, and the TV show The Expanse, and I spent a day working as an extra on Grimm (watch for me in episode 516, “The Believer”). I’m still plugging away on Arabella book 2, and hope to have a draft done by the end of this month. Thank you to Sue & Rich, Alex & Isobel, Shannon, Anne, Catherine, Janna, Bo & Don, Geri, Simone, Melissa, Mark, Patrick & Teresa, Lise, and everyone else who helped out, came for a visit, or shared a meal. Our plan for February is for Kate to get as much exercise as possible. If you are in town and could come by some time to go for a walk with her, especially if we could make it a regular thing once a week or so, that would be awesome. Apart from that, any time you can come by for a visit you’d be welcome. Things are going pretty well around here. Kate took two doses of Avastin, and the following MRI showed that the radiation necrosis has almost completely vanished; also, the space where the tumor was removed has involuted (closed up) somewhat. This is very good news, but the aphasia is slightly worse. The doctor doesn’t know for sure why this is so, but my guess is that the changes in her brain, although positive, are nonetheless disruptions and the brain needs to re-learn how to work in the new configuration. The really good news is that there is still no sign of any residual or recurring cancer, though it could still return in the future. With the positive MRI we have tried reducing Kate’s steroid dose from two pills a day to one and a half. So far this dose seems to be working pretty well, but we haven’t yet seen any positive effects from the reduction (such as a decrease in blood sugar, or less swelling of the feet). These will probably take weeks to appear. We will meet with the oncologist next week and discuss additional doses of Avastin and/or a further decrease in the steroids. Apart from that, Kate is basically stable. She’s still managing her blood sugar pretty well, getting around with the walker, and in a generally good mood. She’s still quite weak and wobbly, and has some memory issues as well as mild aphasia, but the naturopath (who sees her once a month, so he is in a better position to observe her progress than I am) says she is continuing to improve both mentally and emotionally. Apart from medical news, the last month has been quite lively. We attended OryCon in downtown Portland, had a Thanksgiving dinner that couldn’t be beat at the home of our friends Paul and Debbie, attended a touring production of Disney’s “Beauty and the Beast,” hosted several house guests, and had a relaxing Christmas Day at home with Kate’s sister and her family. Thanks to Mary Kay, Ulrika, Janna, Mark & Shannon, Mark, Robin, Paul & Debbie, Arashi, Nancy, Jacob & Teresa, Mary, Sara, Dave, Felicity, Mara, Ruth, Barb & J.C., Michelle, Allan, Marc & Patty, Sue & Rich, Alex & Isobel, Katy & Eli, Ron & Janet, and everyone else who helped out, came for a visit, or shared a meal. 2015 has been a very difficult year, and there’s no getting around that. But we are also very lucky — we have friends and relatives who love and support us, enough money, good insurance, excellent medical care, and few other obligations. We really appreciate all of you and look forward to spending more time with you in 2016. After the con, on Sun Nov 22 at 4:00pm, the ninth annual Sci-Fi AuthorFest will be held at Powell’s Cedar Hills. This event, which brings together “a starfleet of science fiction and fantasy authors” — many of whom just happen to be in town for OryCon — for “one galactic booksigning event,” is free and open to the public. I’ll be there and so will a bunch of other cool people. Hope to see you there! It’s been over a month since my last update, but that’s because there hasn’t been a lot of medical stuff to report. This is a good thing. Kate’s been doing well, getting around with the walker and managing her own blood sugar. We had another MRI, which was basically exactly the same as the previous two. That makes six months with no change, which is good because there’s no new tumor growth but bad because the radiation necrosis isn’t getting any better. Radiation necrosis causes brain swelling, which requires steroids, which cause puffiness and muscle atrophy and irritability and diabetes, which requires insulin, which means a lot of sticking with needles, which increases the irritability. So we really want to do something about it. As mentioned back in September, there’s a drug called Avastin that can be used to address radiation necrosis. We passed on it then, because it can have nasty side effects (most people have no issues with this drug at all, but a very small percentage have life-threatening problems). A month later, with no additional falls and with an MRI demonstrating no improvement in the necrosis, the balance has changed and we have decided to try it. It is given intravenously (that means 45 minutes in a recliner at the cancer clinic) and we will be doing three doses at two-week intervals. She got the first dose yesterday and has had no side effects whatsoever so far. There are no guarantees in this business, but the oncologist has had very good results with other patients, so we’re hopeful. If it works, we should start to see some improvement fairly quickly. Reducing the steroids and building the lost muscle back up will take months. Until then, life goes on. The antidepressants are helping me a lot, and I’ve gotten several bits of good writing news which I’m not yet at liberty to divulge. One news item I can share is that my story “Damage” is currently at the top of the Suggested Reading List for the Nebula Awards. This doesn’t guarantee a Nebula nomination — it only means that several SFWA members liked it enough to recommend it — but it bodes well. Most of our news in recent weeks has been non-medical. We have finally (finally!) finished the seismic upgrade on our foundation, which should make the house less likely to fall down in an earthquake and, as an added bonus, resulted in a thorough decluttering of the basement. We have seen a lot of excellent local theatre. I attended the Oregon Writers Colony’s Stumptown Lit Fest and read at the Annual Reading of Oregon Jewish Writers. We also dealt with an invasion of ants, a pretty major plumbing issue, and necessary maintenance on the furnace. We both traveled to Saratoga Springs, NY for the annual World Fantasy Convention, after which we visited my dad in Milwaukee for a few days. The convention was worthwhile — for me it mostly involved hanging out with writers and editors in the bar and in a series of very good restaurants — and my dad, who is 83, is doing quite well. OryCon, the Portland science fiction convention, starts tomorrow, and we’ll both be attending that. Hope to see some of you there. Thanks to Shannon, Brenda, Ron, Janna, Felicity, Arashi, Bo & Don, Ann, JoLyn, Mark, Mara & Ian, Pam, Michelle & Pat, John, and everyone else who helped out, came for a visit, or shared a meal. We’ve been doing this for nearly a year now (the diagnosis was 11/22/14) and your support is more important than I can say. September was mostly about recovering from what happened in August. As you may recall, in August Kate was diagnosed with steroid-induced diabetes, spent four days in the hospital because of it, and was prescribed insulin to deal with it. Then, while I was at Worldcon, she had a pretty nasty fall on the sidewalk by the library. In September she wound up having a root canal on one of the teeth that was damaged in the fall. The anesthesia for that was pretty traumatic, but once that was done the root canal itself was no problem at all. After the fall she also noticed a weird “thing in her nose” — neither the oncologist nor our GP knew what it was, but we got a referral to an Ear, Nose, and Throat specialist (the only doctor I have ever actually seen use one of those round mirrors on a headband that doctors always have in cartoons) who said it was a deviated septum, basically a “buckle” in the cartilage of her nose. This is annoying but not a serious problem; it can be corrected but would require surgery, general anesthesia, and a night in the hospital so we are leaving it alone for now. Apart from those issues, and some remaining bruising, she’s completely recovered from the fall. However, in addition to that fall she’s had several others — none resulting in injury, but still very disquieting — and so, on the stern advice of our naturopath, she’s started using a walker. Not one of those ugly gray ones with the tennis balls, though; this one is shiny and purple and has four wheels. With the walker her balance, range, and speed are greatly improved. We also looked into using a drug called Avastin to address the radiation necrosis that’s visible on Kate’s MRI scans (and which contributes to the swelling that requires the steroids that cause the diabetes which requires the insulin that lives in the house that Jack built). It turns out that, although most people have no problems with this drug, a few patients have what the oncologist called “catastrophic” (i.e. life-threatening) side effects. We decided to pass on this drug unless the necrosis gets worse or the cancer recurs. Kate’s energy and initiative have improved considerably as we get away from the last round of chemo (July), and the tremor and foot drag have also gotten better. She is doing her own blood sugar tests and insulin injections, and her glucose levels seem to be well under control. She does still have some aphasia and short-term memory issues, but all in all things are not bad right now. As for me, I’m… well, I haven’t been coping as well as I would like. I’ve started taking an antidepressant called Celexa, which should help, but it will take a few weeks to have its full effect. It also helps that the release date, publicity quotes, and gorgeous cover for my novel have been revealed. You can see them at https://daviddlevine.com/arabella (click on the cover thumbnail there for a bigger version). Thanks to Ann, Mark, John, Dave & Merilee, Ruth, Shannon, Arashi, Michelle, Melissa, Paul, Sara, Cynthia, Bill & Lynn, Teresa, Ulrika, Nancy, Sam, Mara, Melissa, and everyone else who came for a visit, brought food, did dishes, or otherwise helped out. You are keeping us sane, to the extent possible under the circumstances, and it is greatly appreciated. You can now hear me read my “Captain Kidd on Mars” novelette “The Wreck of the Mars Adventure” on episode 405 of the StarShipSofa podcast. 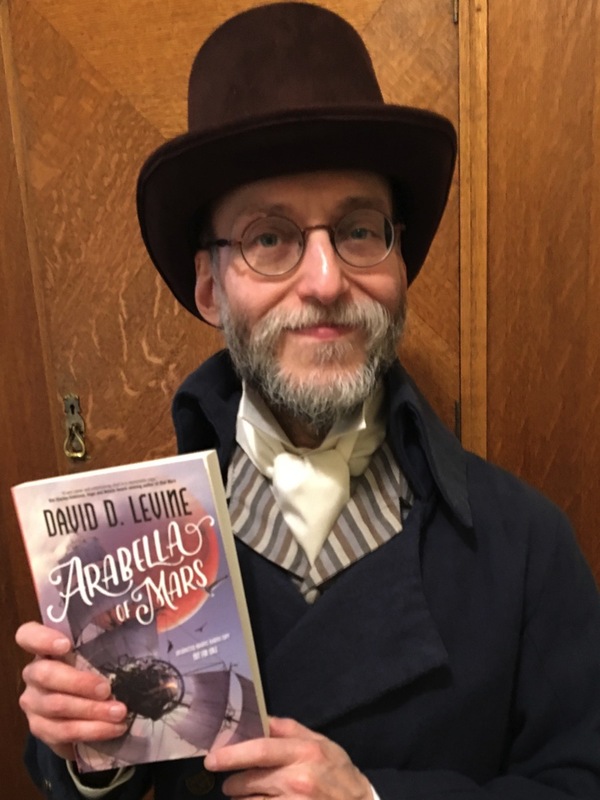 This story was originally published in anthology Old Mars, edited by George R. R. Martin and Gardner Dozois, and is a prequel to my forthcoming novel Arabella of Mars.